For this post I wanted to come up with something a little easier on the eye than my previous offerings (Loading DTDs using DOM in Python, Colorised svn diffs and How do you like your Fortran 95 interfaces?). 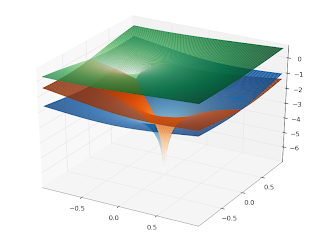 I've been developing code for computing complex values of Lambert's W function, and I thought I'd share the Riemann-surface plots above, which are, from top to bottom, Re(W), Im(W) and abs(W) for the branches -1 (Blues), 0 (Greens) and 1 (Oranges). The route I've taken to get the plots has been a good learning experience for me. First approachMy initial idea was to write a mex wrapper to my algorithmic Fortran code, along the lines of what happens for the NAG Toolbox for MATLAB. I also wanted to see if I could provide a vectorized interface, as native MATLAB functions have. Whew, it's not much fun debugging mex files, is it? Hi, I'm Marcin, technical support engineer here at NAG and I've recently encountered an interesting problem. I coauthored a recent paper on option pricing with the NAG Library (Option pricing in Excel). My coauthor Jeremy subsequently blogged about it (Extending, imitating and collaborating). Now it’s time for the next step.